I'm currently hiding in my bedroom because I've stolen the last bit of the cranberry juice...my dad is going to KILL me. He is rather fond of cranberry juice, how healthy haha. Besides from stealing juice, I've had a pretty lazy day today, I'm taking full advantage of the bank holiday and I've caught up on much needed sleep and listened to Fleetwood Mac for quite a while now. My best friend Harry is coming round in apparently 7 minutes to watch some Inbetweeners or Essex - he sounds exactly like Mark Wright which is slightly creepy at times haha. How have you spent these past few days? I've finally bidded on a leather pleated skirt, I have a horrible fear it will rise up to £50 though :S It was only £14 when it was being sold in the shop! -_- My plans for this week include seeing The Dictator with Harry (with nachos), shopping and going to work. It'll be my second week at Red magazine! It's already going too quickly :( Anyway, I thought I would do my version of how I would wear maxi skirts. I am dying to find a bright fuchsia pink one - I've looked everywhere but I can't find it! Yes, that skirt is perfect, I love it, so chic. Two great outfits!! Zara have some lovely maxi skirts atm too! I've got my eye on a raspberry coloured one similar to this one! i love them.. very nice outfits! i love it :) would you like to follwo each other? followed you already. I love pleaded skirts, they are my favorites! 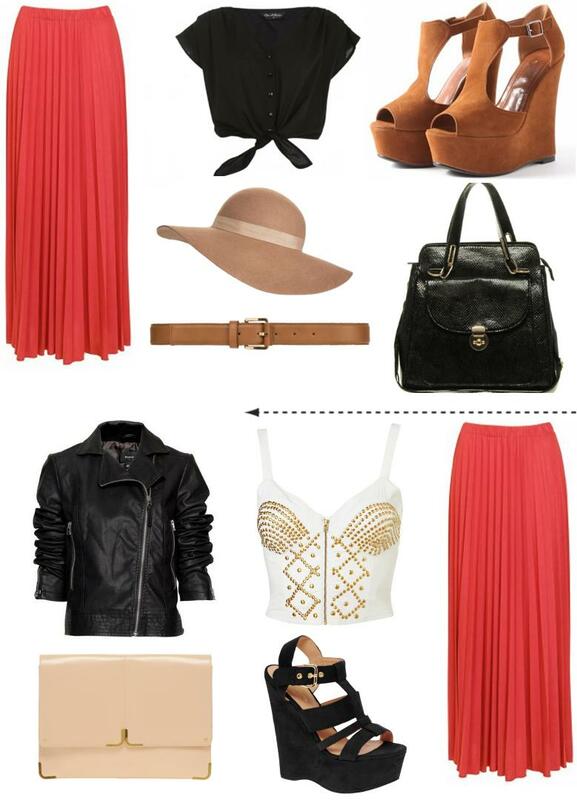 Hope you manage to get the pleated leather skirt! Your plans for the week sound fun! Oh my gosh, "The Dictator" is SO funny!